Hier mein Polarlicht Artikel auf englisch. Thomas Kast is freezing. Blackness surrounds him. It’s three o’clock in the morning. He’s standing in a snowy forest glade in the middle of nowhere, waiting for the Northern Lights, also known as Aurora Borealis. You can see the resulting photos in our slideshow below. Kast is exhausted. The thermometer shows 18 degrees below zero Celsius (zero degrees Fahrenheit). His eyes scour the night sky. His camera is displaying early signs of freezing up. For hours he’s been standing in the cold, hoping to experience a moment of magic: the appearance of the Northern Lights. Originally from near Karlsruhe, Germany, Kast has lived in Finland since 2000 and works for a major mobile network company based in Oulu, a university town of 190,000 people about 200 kilometres south of the Arctic Circle. He came to Finland for career reasons and wound up staying after he met the love of his life. After his family, the Northern Lights form his other great passion. A camera, a tripod, spare batteries, a torch and a flask of tea: That’s about all he needs when he sets out into the night – apart from three or four layers of clothing and warm boots, of course. “The worst thing is the cold fingers,” Kast says. It’s impossible to operate the camera’s small buttons wearing thick thermal gloves. 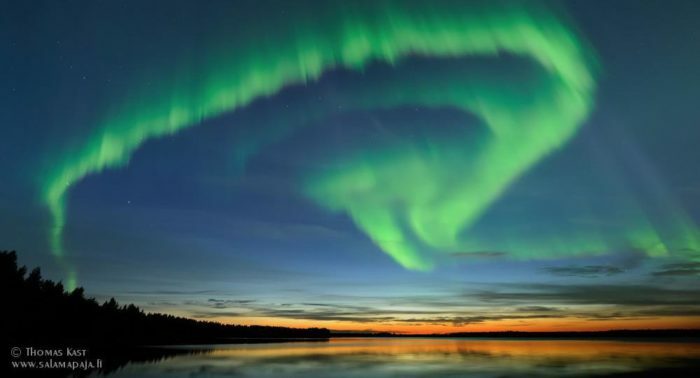 Before he heads out, the Northern Lights obsessive pores endlessly over various websites giving predictions of where to catch the Aurora Borealis. A blur of tables, graphs and figures demands to be deciphered and correlated. Geomagnetic fields, wind speeds, the surface activity of the sun and many other factors influence his decision. And you need patience and, if possible, absolute darkness. Even streetlights can hinder visibility. 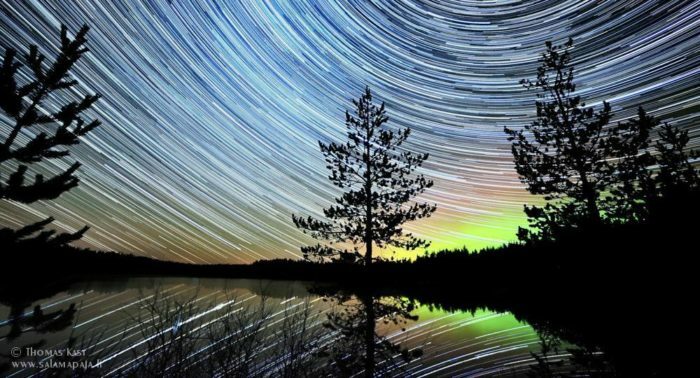 Sometimes Kast journeys for hundreds of kilometres just to enjoy cloud-free skies somewhere in northern Finland – just to capture the mesmerising Northern Lights. 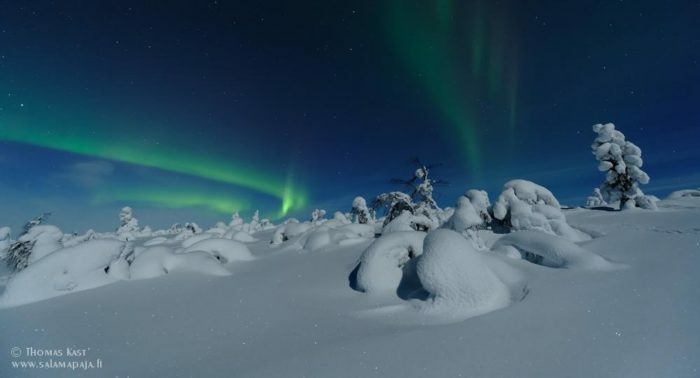 More than 60 freezing nights resulted in hundreds, maybe even thousands of photographs, from which Kast created a time-lapse video entitled Aurora: Queen of the night. The Northern Lights don’t lend themselves to being filmed. A still photo with a long exposure time is required to capture them, so Kast made a time-lapse video instead. “In this respect, the human eye is far superior to technology,” he says. What began as a hobby now takes up an increasing amount of space in his life. He blogs about it, offers Aurora Borealis trips for tourists and has published a calendar of his photos. Oulu’s Tietomaa Science Centre bought Kast’s four-minute film and shows it on a screen eight metres long and four metres high (26 by 13 feet). “The film is a long-held dream come true”, says Sampo Puoskari, Tietomaa’s liaison coordinator. Kast stands before the huge screen in the otherwise pitch-black space and gazes, entranced, at his time-lapse sequences. His eyes shine. He still finds it magical when he sees the Aurora Borealis dancing in the night sky with his own eyes. The cold and exhaustion are forgotten. “Sometimes it’s so magnificent that I’m rendered speechless with awe,” he says. by Tarja Prüss! toll, ich freue mich. Meehr davon….